The (Not Quite) Stunning Conclusion! This is part 3 in a series and this review won't be mindful of spoilers from the previous two novels. 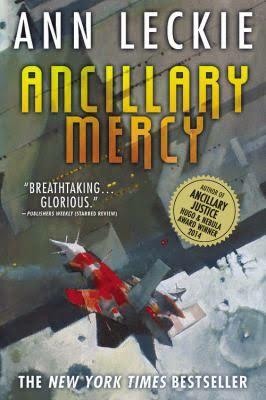 The spoiler-free review is that Ancillary Mercy says a lot and does a little and failed to impress me like the first novel in the series. 4/10. I've already said it in the note above, so I'm not going to waste time here: Ancillary Mercy did not impress me. It continues the story left off at the end of Ancillary Sword in the same exact manner as Ancillary Sword picked up from Ancillary Justice. It's more Ancillary Sword than Ancillary Justice, and that was a huge disappointment to me. Following the events of Ancillary Sword, Breq remains committed to the protection of Athoek station and the continuing the sea change she brought to that region of Radchaai space. However, the Presger have taken notice of the loss of their translator, and Anaander has finally caught up with Breq. I struggle to think of any particular part in the 300 some odd pages of this novel that I genuinely enjoyed. It moves at a pace that doesn't seem to move fast enough, yet doesn't accomplish much in what it does. There are a lot of powers and forces at work in this part of space, but none of them seem to be moving until they've caught Breq's attention. The threat of the Radchaai fleet is reduced to a few ships and one angered instance of Anaander, but that's okay because Breq's crew consists of herself and maybe five others. Again, the enormous scope of Ancillary Justice is reduced to a dozen characters in a tiny corner of space doing very little. Of particular annoyance in the Presger visitor, whom I only lightly hesitate to call a Jar Jar Binks-like character. Much of the previous two novels make the Presger sound inscrutable and extremely dangerous in the way humans are dangerous to transient vermin. However, the manifestation of the Presger in this novel can be described as cute or funny. She's the comic relief. The other non-Radchaai character is snarky, sarcastic, and utterly toothless as well. Anaander herself, Lord of the Radch, isn't much of a threat. It's a problem that plagues the whole story: after Ancillary Justice, Breq has no threat and no mission. She's doing what feels right without much motivation. Sure, she's making changes, but there's no plan. We've gone from "I'm going to kill the Lord of the Radch" to "I don't know why I'm here, but I guess I'll try to make things better where I can". I genuinely don't see what's garnered so much praise about this novel. I'm going to go read some of the glowing reviews it got; maybe they'll help me figure out what I missed, if anything.